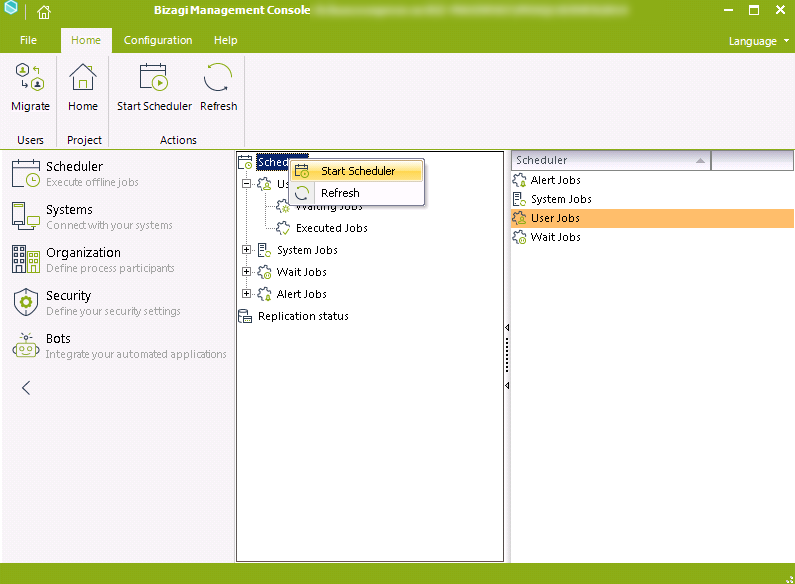 In the Bizagi Management Console, use the Scheduler module to directly administer Jobs which the Scheduler service runs. The Scheduler's icon indicate this service's status (gray when stopped, crimson when started). You can start, restart or stop the Scheduler service directly from these options. To do this, right click the Scheduler icon and select the action (Start, Restart, Stop). You can also select an action in the Main menu area. The scheduler MUST BE in started status in order any scheduled jobs. Sets of steps that can be run according to a schedule: run once by specifying a specific date, or run periodically during a given period of time. The status of these jobs can be consulted in this category. We do not recommend that you manipulate the information of system jobs (they are listed for tracking and error diagnostics purposes). Scheduled jobs that are related to Process Activities. In this category we find such jobs as timers and Asynchronous Activities, and can consult their status. Alarms are messages sent to different target groups when an activity is about to expire, expires or has already expired. 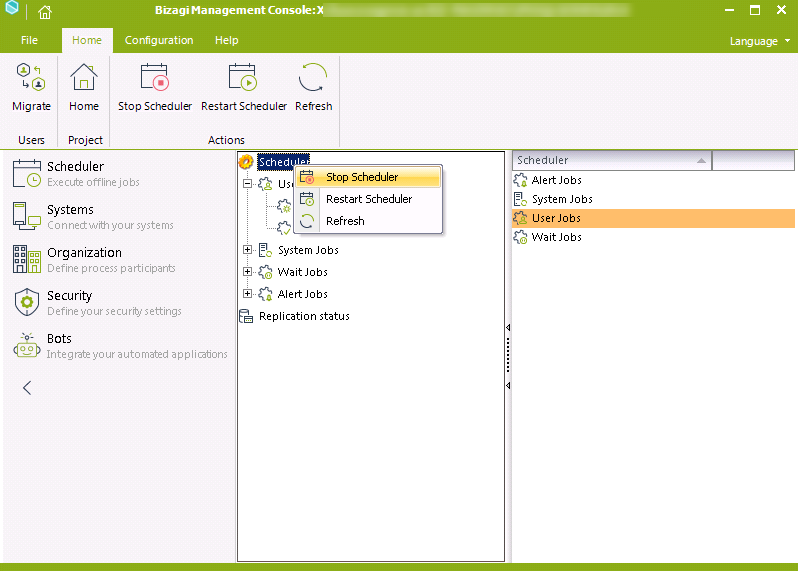 In this scheduler category, the jobs related to configured alarms are stored. Notice that disregarding the classification above, all jobs appear under two lists: those waiting for execution, and those successfully executed. Should any waiting job fail (or require transaction rollbacks), it will be still listed in a waiting status. See the details of scheduled executions (planned jobs). See the log of previous executions. Click this button to automatically enable a waiting job and set it for immediate execution. The time will be set to 10 minutes before the current time to be executed the next time the scheduler runs. 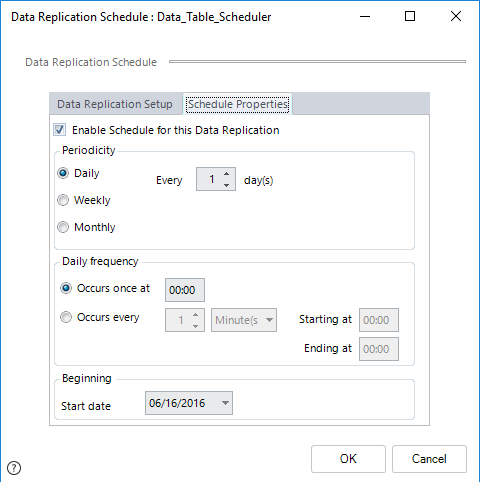 You can manage and reconfigure the schedules for Replication in your project. Within these options you can also disable scheduled executions. 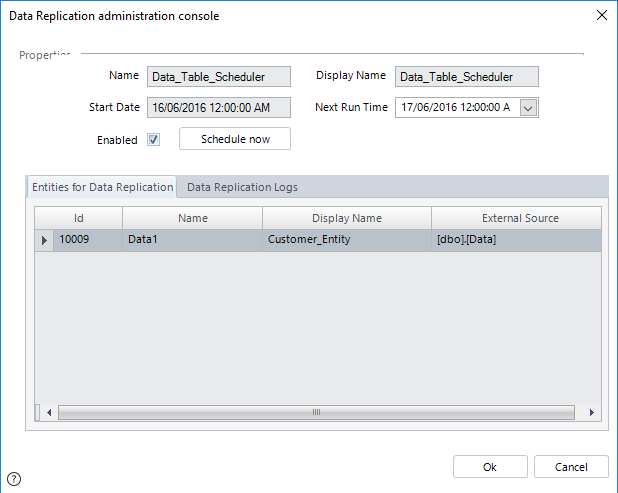 See the log of previous Replication synchronization executions. Click this button to set the Replication for immediate execution. This option presents the properties of the Replication Schedule. This modifier further defines the interval selected in the above-mentioned Periodicity option as follows. •Weekly option: Enter the number of weeks between repetitions of the execution. Also, specify on which weekdays this schema will be executed. •Monthly option: Enter the number of months between repetitions of the execution. Additionally, select the day of the month in which this schema will be executed. Define if the execution happens once a day (and at which time), or if it should be executed at a certain time interval (minutes or hours). 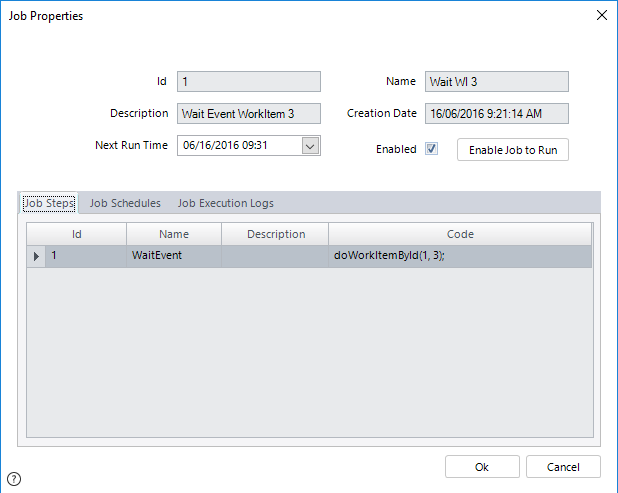 Set a starting date for this schema to begin its execution.